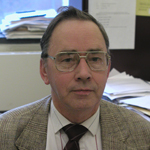 Dr. Jeffers joined the faculty of the Mechanical Engineering Department in 1968. Dr. Jeffers received his B.S. in Mechanical Engineering and M.S. and Ph.D. degrees in Engineering Mechanics from the University of Pennsylvania in 1964, 1965 and 1969, respectively. His areas of research interest are in plates and shells with cut-outs, dynamics of systems, and applications to mechanical design. Dr. Jeffers has been active in both the American Society of Mechanical Engineers and the American Society for Engineering Education. He has served on the ASME Council on Education through the Board of Engineering Education, the ASME Council of Public Affairs through its Committee on Issues Identification, and on the ASME Council of Member Affairs as Vice President. Dr. Jeffers has served as Senior Vice President and then served on the Board of Governors of ASME.